It's true that she refers to Southern traditions and ways, but I was able to relate to her as a woman and mother in many of the circumstances. And of course, I loved her Southern accent and colloquialisms. Her take on sassin', gratitude, Southern grandmothers, success, we-know-Mom's-crazy rule and the art of bargaining had me nodding my head and laughing out loud. 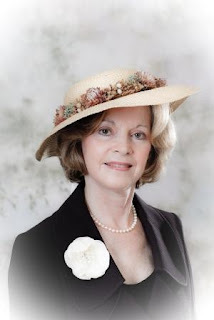 She mentions several times about how polite Southerners are, and I believe her, but I must say, there was an incident that caught me off guard when she slammed the door in someone's face! These are not profound anecdotes--although the discerning reader will glean a few gems--but mostly personal accounts meant to entertain with the use of exaggeration and lots of humor. Some of the anecdotes are as short as two pages, making this a quick and light read. It's one of those books you can leave on a coffee table for guests to enjoy and for you to re-read when you're itchin' for some good ole Southern humor. 1. How did you decide which anecdotes to include and which to exclude? That was one of the more difficult parts of the editing process. My daughter, who is very good at editing, spent hours with me going over the stories and together we hashed out what worked best. I reminded her I had spent six hours in labor to have her and this was payback! It was also nice to have someone who could be more objective to sense if the anecdote worked. 2. You write about funny but potentially embarrassing moments experienced by family and friends. Did you ever worry about offending anyone? I absolutely did worry about that. I was raised in a household filled with humor, but I was taught at a very early age that you laughed with people NEVER at people. I worked very hard to accomplish that. My immediate family played a part in many of the anecdotes and they were great sports. They were amazed I could write something besides thank you notes! 3. From your stories, I can see you love shopping in NY. What’s your favorite thing about being in NY besides the shopping? Isabella (from the book) and I LOVE Broadway shows and we LOVE to eat. We also work in the ballet. Brunch at Balthazar's in SoHo is a must! 4. Your anecdotes reveal a stable and good relationship with your hubby. Any advice for today’s woman on how to make a marriage last? I read this very true quote once: "Sexiness wears thin after a while and beauty fades, but to be married to a man who makes you laugh every day, ah, now that's a real treat!" Besides having the finest character of any man I know, my husband is the funniest man I know. Every marriage has its ups and downs and, during a down time, I have been known to look at my husband and say, "You better be glad you are funny." So my advice to today's woman is to find a man who has great character and who will make you laugh. 5. What was the last great book you read? One of my goals each year is to read some classics. I just finished Edith Wharton's Age of Innocence and Gustave Flaubert's Madame Bovary, both beautifully written. A modern great book I just finished is The Guernsey Literary and Potato Peel Pie Society by Mary Ann Shaffer and Annie Barrows. I could not put it down. It is one of the most endearing books I have ever read. 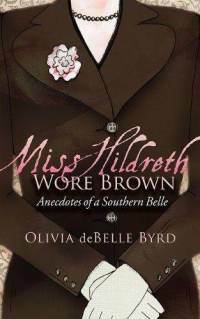 Born and bred in the South, Olivia deBelle Byrd is a graduate of Birmingham-Southern College and a Kappa Delta. Olivia is the third generation of her family to call Panama City, Florida, home. She and her husband, Tommy, are the proud parents of Tommy Jr. and Elizabeth. Tuesday, April 19: Books and Life! What a fun book and lady! Thank you. The book does sound like a lot of fun! Southerners are just a little bit different, but in a good way. I loved this book too! Great interview also! This one was totally fun! I wish I had thought to mention the "Sassin'" antecdote in my review; it had me nodding my head and smiling! I enjoyed this book, too. Loved the interview! I'll have to remember to use the line about her daughter helping because of the time she spent in labor, though I don't think it would work on my daughter.